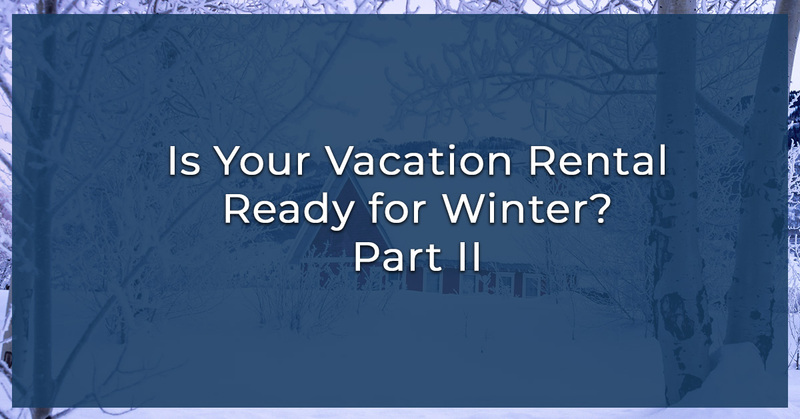 Welcome back to our blog series on preparing your vacation rental for winter! In our first blog, we talked about how to close up your vacation rental if it’s not going to be used in the colder months. Today we’re diving into how you can prepare your property for winter, so that your guests will thoroughly love their stay. Learn more in our blog, and contact First Western Federal Savings Bank to apply for a rental property loan that can set you up for owning a vacation rental! If your rental property is in a location that doesn’t experience significant winters (like Southern Arizona or San Diego), you likely won’t have to make many changes to prepare your home for the season ahead. 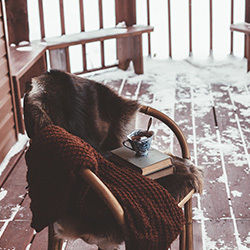 But if you’ve got a cabin in the woods, a quaint mountain house, or a property in a bustling ski town, you’ll have some work to do to make sure your rental is suitable for guests in the winter months. Consult with an HVAC specialist. There’s nothing more anxiety-inducing than getting a call from one of your renters that the heating isn’t working. Not only will you feel bad that your guests aren’t comfortable, but a bad review could leave your property in jeopardy of getting as many visitors as you’d like. Prevention is key to ensuring your property is set for the winter, and working with an HVAC specialist is the first place to start. Your heating and air system can be in dire need of replacement within a decade, or it can last twice as long if it’s properly maintained. Call someone to check on your heater, water heater, air ducts, and thermostat before it’s too late — and of course, make the necessary changes immediately to keep your rental property in business. Air leaks won’t only make guests cold and uncomfortable, they’ll rack up your energy bill. This is in part due to the wasted energy that’s being consumed — it can just leak outside, after all — and in part because when it feels colder, guests are more likely to crank the heat. Look for places that could stand to better insulated, and caulk up areas as needed. Have snow removal equipment ready to go. Is your snow blower in working order? Do you have salt or sand on deck? Are your shovels up to snuff? If not, now’s the time to stock up on snow removal equipment. Make things easy for guests to understand. Most people who are renting out properties don’t want to hear from their guests every single time something comes up. There will always be exceptions, but for the most part, this responsibility of keeping your guests informed falls on you. Knowing how to adjust the thermostat, where to put snow-covered boots, how to get into the property, and how to work the gas fireplace are just some examples of things that guests will want to know. Provide an informational flyer or note sheet for guests that sets expectations, answers their potential questions, and is easy to follow. We talked about animals in our last blog, and the same prevention methods (such as not leaving food out and closing up leaks in your home) can be applied to your rental property. But when people are actually renting out your property it’s a little different. By that, our rental property loan lenders mean that it’s not as big of a deal if a mouse gets in your house in winter and no one’s there. If you have guests at your property and they see a mouse, this will not bode well for you. Take precautionary measures to ensure that critters don’t start to call your rental property their new home. In addition to some of the preventative methods we’ve mentioned, you should check up on your property frequently, find pest control solutions that work for you (be it traps or professional help), and take action the moment you notice something’s wrong. In addition to creatures coming to your place, preventing fire (particularly if you have an older rental property) and pipes from bursting are also essential. Let guests know in your house guidelines document of any necessary measures they need to take while renting out your property — keeping the thermostat above 55 degrees is a great example. Winter does not have to automatically mean your vacation rental property is closed for the season. In many instances, people have amazing properties that could easily be filled up with renters in winter. Taking care of your vacation rental is the way to ensure you continue generating revenue off of your property all year long. If you’re ready to apply for a non-recourse rental property loan, our lenders at First Western Federal Savings Bank are more than happy to help you get started! Contact us or fill out our online application to get started.